I'm a very slow painter. 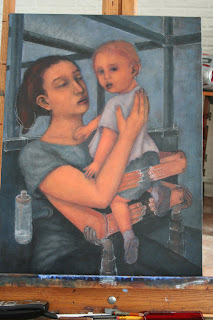 The paintings in the blog represent months of painting time, and the drawings take about a week. It's partly because I have quite a few plates to keep spinning at once, and partly because my technique just takes time, both in the sense that I work in many thin layers of paint that have to be built up over time, and also because it takes my brain a long time to see what needs to be done. Since I generally don't use visual reference material , I tend to fuss over things like perspective and proportions for a long time. I also find that the idea continues to evolve as I work, and I go through many titles until I find one that works. This one has the working title of Scaffold. Some others that I am considering are Modernism on a Subway in D.C., Innerscape and Study in Grey on a Subway in D.C.